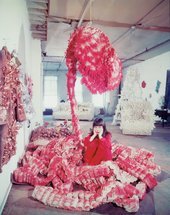 Yayoi Kusama tells the story of how when she was a little girl she had a hallucination that freaked her out. She was in a field of flowers when they all started talking to her! The heads of flowers were like dots that went on as far as she could see, and she felt as if she was disappearing or as she calls it ‘self-obliterating’ – into this field of endless dots. This weird experience influenced most of her later work. ‘Our earth is only one polka dot among a million stars in the cosmos. Polka dots are a way to infinity. When we obliterate nature and our bodies with polka dots, we become part of the unity of our environment’. She also creates environments of dots so that we can experience this feeling of self-obliteration too. 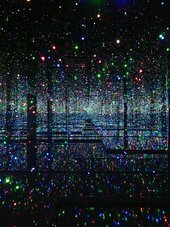 She calls these rooms her 'Infinity Rooms', and creates them by installing hundreds of flashing coloured LED lights into mirrored rooms. The pinpricks of light in the dark room reflect endlessly in the mirrors, making you feel like you are in an apparently endless space. The dots surround and engulf you…it's very hard to tell where you end and where the rest of the room begins! 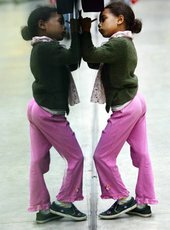 Yayoi was born in Japan in 1929. 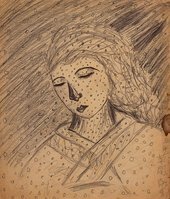 She loved drawing and painting and although her parents didn't want her to be an artist, she was determined. When her mum tore up her drawings, she made more. When she could not afford to buy art materials, she used mud and old sacks to make art. This is a drawing she made of her mum when she was 10-years-old. 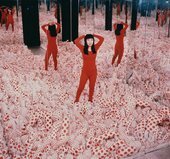 Eventually Yayoi Kusama persuaded her parents to let her go to art school and study painting. In the late 1950s she moved to New York as lots of the most exciting art seemed to be happening there. It must have been a bit frightening arriving in a big city with such a different culture from what she knew. But she was determined to conquer New York. She later wrote about her feisty attitude: ‘I would stand up to them all with a single polka dot’. Yayoi Kusama lying on the base of My Flower Bed 1962 in New York, c.1965 © Yayoi Kusama / Studio Yayoi Kusama, Inc.
She had the first of many exhibitions there in 1959. She met and inspired important artists including Donald Judd, Andy Warhol and Joseph Cornell, and her art was a part of exciting art developments such as pop art and minimalism. She was also one of the first artists to experiment with performance and action art. As well as being an art pioneer, Yayoi Kusama put her creativity into other things including music, design, writing and fashion.